Des Kennedy is a West Coast original–when he writes about how everyone can live in harmony with nature, he walks the walk. 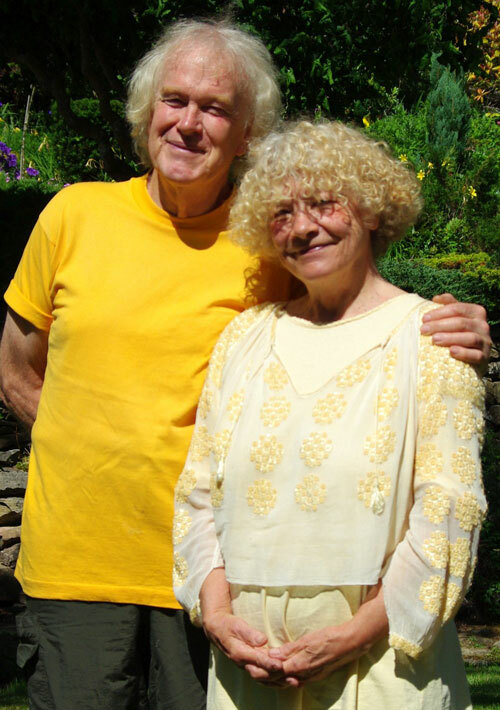 The gardens he and his partner Sandy have created on their acreage have been featured in various books, magazine articles, calendars and television programs. Starting with a stump ranch, Des and Sandy put in their fruit and vegetable garden on Pickles Road in 1972, adding an ornamental garden in 1980, featuring mostly annuals, biennials and wildlings. “In 1988 we rather recklessly expanded the ornamental area,” he says, “focusing on old roses, unusual perennials, shrubs and trees and considerable stonework.” Also excelling as an award-winning journalist, broadcaster and environmental activist, Des Kennedy has lived for more than 40 years on Denman Island. Des Kennedy was born in Liverpool, England in 1945. He immigrated with his family to Toronto in 1955 and moved to British Columbia in 1968. He was a founder and editor of The Denman Rag & Bone community newspaper in the 1970s and became a regular contributor to Monday Magazine in Victoria. Through the 1980s, he wrote feature articles for a variety of national magazines including Harrowsmith, Nature Canada, Canadian Geographic, Probe Post, and Canadian Heritage. 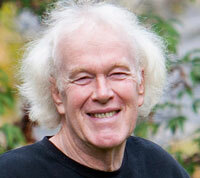 For seven years he wrote a gardening column for The Globe and Mail and was a columnist for GardenWise magazine. As well, he wrote dozens of stories for gardening magazines including Gardening Life, Canadian Gardening and Western Living. Kennedy has appeared many times on TV shows such as Harrowsmith Country Life, The Canadian Gardener and the Guerrilla Gardener. For eight years he was also a weekly columnist on the national CBC television program Midday, contributing pieces on gardening, country living and natural history. Des Kennedy was the host and co-writer of a documentary mini-series titled Reinventing the World, broadcast on Vision TV in 2001. This series featured five one-hour documentaries on Food, Work, Economics and Sustainable Cities and included interviews with leading thinkers on these topics from Canada, the U.S. and Brazil. A subsequent television series, Finding the Future, consisting of 13 half-hour programs in each of which Kennedy interviewed celebrated thinkers and activists, was also broadcast on Vision TV. A one-hour documentary based on his book Living Things We Love to Hate was broadcast on Discovery TV. A noted satirist and lecturer, Kennedy has spoken and performed at numerous conferences, schools, festivals, botanical gardens, art galleries, garden shows and wilderness gatherings in Canada and the U.S. For several years Kennedy hosted garden tours in Ireland, New Zealand, China and England. Des Kennedy’s multi-faceted memoir The Way of a Gardener includes memories of his upbringing in a strict, working-class Irish Catholic family and eight years within the cloisters of a monastic seminary. One of his heroes is Trappist monk Thomas Merton. Kennedy published his first two poems in 1966 in a national Catholic weekly magazine called Ave Maria. The 52 chapters in An Ecology of Enchantment provide a week-by-week chronicle of his gardening life. Crazy About Gardening was shortlisted for the 1995 Stephen Leacock Medal for Humour. His first novel, The Garden Club, in 1996, was also shortlisted for the Leacock Medal, as was his 2006 book of essays The Passionate Gardener. His novel Flame of Separation was noted in the Encyclopaedia Brittanica’s international Literature: Year in Review 2004. At present Kennedy is one of the organizers of the Denman Island Readers and Writers Festival, hailed by the Globe and Mail as one of the best small literary festivals in Canada. Kennedy’s “In Conversation” events at the festival have included his conversing with Miriam Toews, Bruce Cockburn, Maude Barlow and Michael Crummey. As well, Kennedy has been active for many years in environmental and social justice issues, including co-organizing the civil disobedience campaign in Strathcona Provincial Park in 1988 and getting arrested at Clayoquot Sound in 1993. He worked for several years in the 1970s and early 1980s as a land claim consultant for two First Nations bands in north-central B.C. and was a founding director of a community land trust on Denman Island. While slick newbies to environmentalism are jumping onto the “re-wilding” bandwagon, rhapsodizing about dirt and water and plants as if Mother Nature is an exotic discovery, Des Kennedy entered his 20th year as a back-to-the-land philosopher in print with Heart & Soil: The Revolutionary Good of Gardens (Harbour $24.95). It’s essentially a ‘best of’ compendium that showcases Kennedy’s trademark humour in wide-ranging essays and articles. A B.C. bestseller, Heart & Soil: The Revolutionary Good of Gardens (Harbour 2014) was nominated for the 2015 Annual Literature Award by the Council of Botanical and Horticultural Libraries. Other authors associated with Denman Island include Wallace Baikie, Graham Brazier, Sheila Carnegie, Bill Engleson, Robert Harvey, Winnifred Isbister, Keith Keller, Jim Kirk, Rolf Ludvigsen, Emily St. John Mandel, Jo-Anne McClean, Norman Nawrocki, Brian Payton, Ron Sakolsky, Ross Westergaard and Hillel Wright. “Every paradise has a serpent, and every bud has a worm. Des Kennedy writes about the bud-littered paradise of the Gulf Islands with the fond and practiced eyes of a dyed in the wool denizen…Gardeners, island lovers, and anyone who has found the activist within will find much here to enjoy.” —Bill Richardson, CBC Radio host and award-winning author. Patrick Gallagher is a fortyish Irish bachelor whose only love is his garden in Southlands, equestrian playground of Vancouver’s landed gentry. Bootless and unhorsed, he lives in the posh neighbourhood on the sufferance of a landowner who provides a cottage and greenhouse on the grounds rent-free in return for his tenant’s botanical expertise. That expertise is prodigious. Gallagher spends weeks, months and years meticulously cultivating exquisite roses prized by fanciers across the country and beyond. His “introductions” are renowned equally for the delicacy of their blossoms and the indelicacy of their names. He is utterly content with his sliver of fame, his modest home and his verdant laboratory—until his sponsor dies. The owner’s son wants to develop the property for housing, leaving Gallagher in a panic. Desperate for “dosh,” he agrees to return to Ireland as the hired pro for a garden tour on the chance that he might find among his charges a female patron of a certain age and position—a financial strategy only slightly less pathetic than his weekly Lotto ticket. Although it’s a week in his homeland, with expenses paid, plus two grand in his pocket, it’s not a prospect he relishes. Gallagher has done his best to forget his family, his boyhood sweetheart and his not-so-savoury pals, all of whom he has betrayed in one way or another. But it has been twenty years and more, and he reckons that if he keeps his head down he might emerge from the tour none the worse off and possibly better. There, in a geranium pot, are the seeds of the tale—and who better to tell it than Irish-born gardening ace Des Kennedy? Based on Denman Island, Kennedy is a popular speaker, broadcaster and writer on all things green and growing, with a résumé that includes a gardening column, four books of essays and two novels. But this is neither a comic nor a sentimental portrait of the auld sod. From the moment Gallagher sets foot in Ireland he feels the ghosts that would undo him closing in, and his blarney and bonhomie soon succumb to darkness. Instead of gushing descriptions of the countryside and its many hues of green, there are sharp observations of downtown Dublin, “where tourists swarm like spermatozoa up onto Grafton Street.” There’s a nod to the modernity and wealth (since collapsed) of the “Celtic Tiger” but there are still corners plagued by the cassock and the gun. Kennedy propels his narrative mainly through dialogue, but he also has a way with a telling detail: the progress of a sowbug across Gallagher’s kitchen counter while he’s on the phone, the wind rattling a loose piece of metal during a chilling interrogation. The supporting characters are minimally limned, appearing only to play off Gallagher. The protagonist himself is unremittingly weak, cowardly and self-absorbed, and it’s a measure of Kennedy’s craft that we care what happens to him. There’s a sudden left turn in both plot and voice at the last, in the chapter that explains the title, however opaquely. It’s a bit of a head-scratcher, but to say more would give away too much.